• Mix honey, yeast,oil in warm water cover and let it sit for 10-15mins or until frothy. • Coarsely crush/ blend chilli, garlic, roasted peanuts & basil. • To this add salt & oil mix well and set aside. • In a large bowl sift wheat flour, ground oats & salt mix well. To this add chopped onion, coriander combine together with the flour. • Make a well in the center and pour in the yeast mixture mix well and start adding warm milk little at a time and gradually mix to make a soft, slightly sticky dough. • Turn the dough out on to a lightly floured surface and knead vigorously for about 5mins until smooth. • Put the dough into a clean bowl, cover with oiled cling film and leave somewhere warm for 1 ½ – 2hours or until the dough has doubled in size. • Pre-heat the oven at 180deg, lightly grease and line loaf tin. • Punch the air out of the dough and turn it out on to a lightly floured surface again and knead once more until smooth. • Now roll the dough roughly to a circle and spread the basil mixture evenly on to the rolled dough and fold the dough horizontally and seal the edges with fork or just your hands. • Rest for 15-20 mins at warm place. • Brush the top with milk/butter and pop into oven at 30-35mins at 180deg c.
• You can mix the basil mixture to the dough the flour and make dough. • You can bake this even using plain flour or combination of both half plain and half whole meal can also be done. Posted on May 7, 2014, in Appetizers, International, Main Course and tagged Basil bread, Bread, Bread Whole wheat stuffed, drchdietfood, Oats Bread. Bookmark the permalink. 4 Comments. what a lovely wholesome recipe! And thanks for the facts about basil. Thank you. 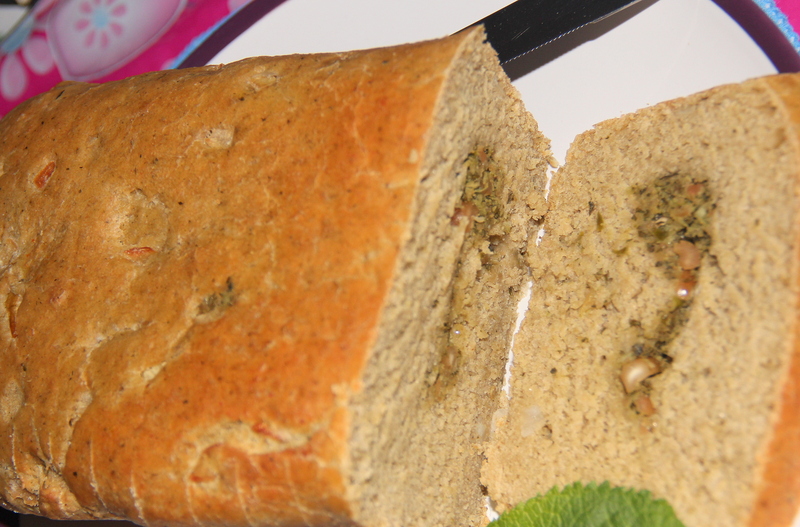 It is a spicy combination of bread & look forward to hear about your post preparation feedback. Thanks Dilip. Basil is fantastic herb for regular usage & good to know about your hobby.